The "revolving tomb" from Seljuk times. Built in 1276 for princess Şah Cihan Hatun. Many Seljuk (and later Seljuk-style) mausolea are a stone evocation of the pre-islamic funeral hills of the nomads of Central Asia. During their lives, prominent clan members had their funeral hill (‘kurgan’) prepared; when death came, a circular tent was erected on top of the kurgan, and the deceased’s body was laid out, in order to be greeted a last time by the clan members. After this greeting period, the body was placed in the burial chamber inside the kurgan. 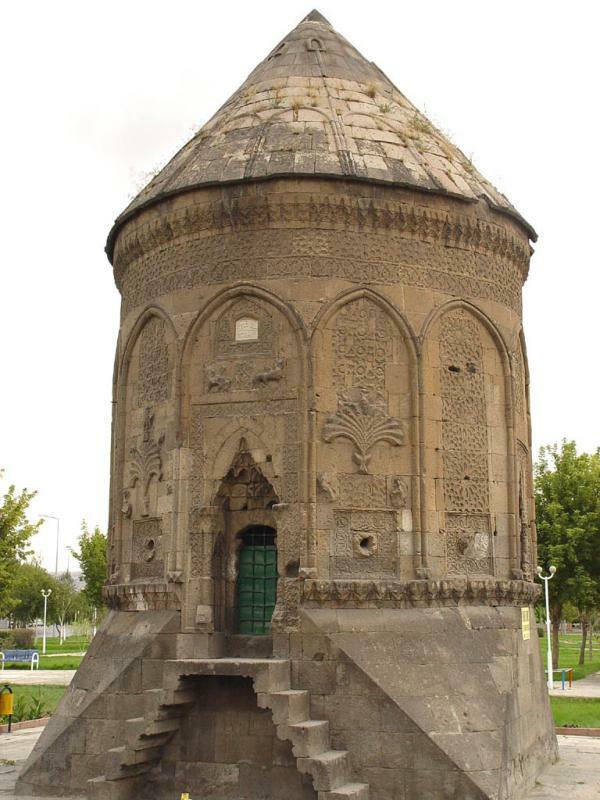 A ‘tent-style’ Seljuk Türbe has two parts: a circular or polygonal room with a pyramidal or cone roof, where a cenotaph sarcophagus can be visited and honoured; this is the part referring to the funeral tent. Beneath this ornamented construction the real burial chamber (‘cenazelik’ or ‘mumyalık’) is to be found, where the deceased’s remains were buried; this is the part referring to the burial hill.